How to calculate exact angle to the moon? I am building some device as a gift for my girlfriend. For this device to work, I need to be able to calculate the angle to which I should look towards (3D angle), in order to see the moon. The location on earth from which I look. I'm sure there's some formula that approximates the angle. I don't need an exact value, I can live with +-1 degree. For a one-off calculation, the easiest solution would be to use planetarium software, such as stellarium. 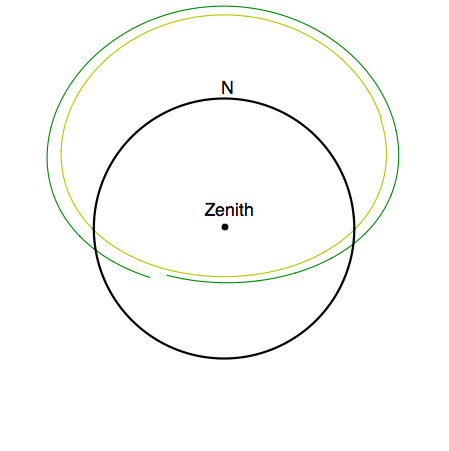 For a programming solution, a python package such as pyephem is an efficient way to calculate the position of the moon at multiple times, in a way that can be imported into a spreadsheet. The apparent motion of the moon is more complex than you might think. The moon moves about 15 degrees per hour due to the rotation of the Earth. But on top of this fairly simple motion is the Moon's actual orbit around the Earth, which is elliptical (and so this motion is not even, the moon moves faster when it is close to the Earth) and the position and inclination of the orbit is perturbed by the Sun. 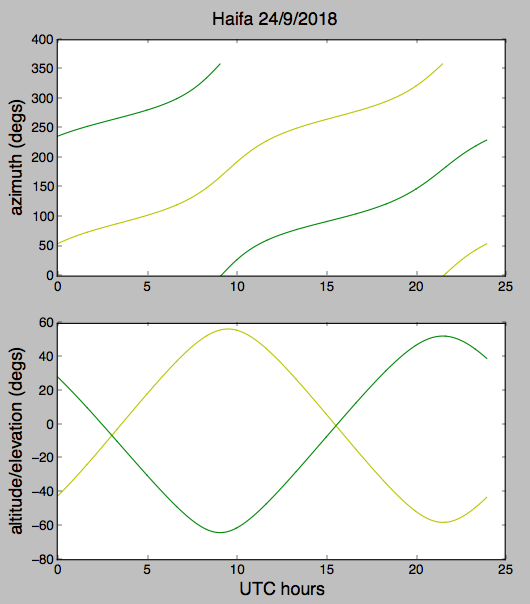 The perturbations are fairly regular, and can be calculated, but these effects (rotation of the earth, the orbit of the moon, the eccentricity of the orbit, perturbation of orbit) combine to make the actual calculation more complex than "a formula" that can fit easily in a spreadsheet, which is why a package like pyephem is recommended. In this answer I mention a source where handy formula for approximate behavior of celestial objects can be found. so there's a good chance in those seven or eight pages for chapter 30 there may be just what you are looking for. I think the "3D angles" you mention would be just altitude (or elevation angle) and azimuth. The first is the angle above (or below) the horizon, and the second is like the "compass direction" except starting at true north, not magnetic north, so it's just 2D. If you are comfortable using Python, one of the easiest computer languages, there is a package called Skyfield. I believe you should be able to get it to run on a Raspberry Pi for example, if your creation is electromechanical. The package is very precise so it generally needs a connection to the internet to "check stuff" which is a little frustrating sometimes. You could also calculate a table for your location, then save it and use it to run a small computer or controller, if you are using one. Not the answer you're looking for? Browse other questions tagged the-moon amateur-observing observational-astronomy or ask your own question. 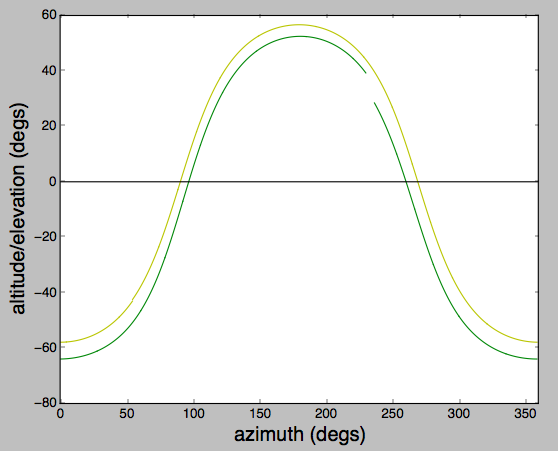 Is there any formulae to calculate whether the sun will depress 18 degrees or more below the horizon on a certain day / location?